I have always been surprised to hear how much sleep babies and toddlers actually need. But when you think about it, little ones tend to go a million miles a minute and have to recharge their battery somehow. Sure, naptime might put a dent in the exhaustion they are likely to face come 2pm, but what about an actual bedtime? For a while, our daughter (she just turned 3) would get her ‘second wind’ around 9pm. So this would entail her running, jumping, playing and doing everything but winding down for the night. Recently, we have tried a few new things that have proven to work for her. So instead of partying each night until 11pm, she now falls asleep by 9(ish) and sleeps through the night. Let me repeat: asleep by 9 and sleeps through the night. Cue the angels singing. I’m sure some of you are thinking, a 2 year old staying up until 11? Trust me, I didn’t love it either, and a friendly reminder: I’m doing my best as a parent. It just happened to take me a while longer to figure it out. And I’m still taking it one day at a time. So, want to know what worked for us? Some people swear by quiet time about an hour or so before bed, but for us, we run, jump, throw balls and do just about anything to get that energy out. She is a busy little girl, so the more tiresome the activity, the better. Walks with the dogs around the block are a go-to as well. With summer time just around the corner and warmer weather within reach, I am (not so) secretly jumping for joy that she will be outside with the neighbors quite often, more than likely meaning an even earlier bedtime for her. The more energy she exerts, the more tired she is in the evening. Picture this: a warm bubble bath with soft lullabies and maybe a rubber ducky or two. Now, add about 25 Peppa Pig figures, 6 My Little Ponies, a few baby dolls and their bottles too. And that is what our bath time looks like, with a little Kidz Bop in the background. I will typically keep bath time for self-directed play, but sometimes I will play with her if she asks me to. Bath time is an absolute must for our bedtime routine. This helps her to relax and get that last little play out of her. We typically do bath time about an hour to an hour and a half before bedtime. We don’t read just any books as we’re getting ready for bed. We specifically choose books that are longer and made for bedtime. Sounds like a no-brainer, right. Even though she doesn’t always hold attention to what we are reading, as long as she is sitting with us and quiet, I am pleased. Not only is reading to your child a great bedtime ritual, but it can foster an early love of reading in children as well. I am happy to say that we have read to my son (now 6) since he was an infant and every night since, and one of his favorite things to do is to grab a chapter book and read to us. Some of our favorite bedtime books are The Rabbit Who Wants to Fall Asleep, The Sleepy Little Alphabet and If Animals Kissed Goodnight. You can find more suggestions at The Best Bedtime Books For Your Toddler Who Hates Sleep. Hint: Our favorite is #6 on the list! Weighted blankets have been said to reduce anxiety and improve sleep quality. They have, what feels like, little weighted beads inside of them and apply a consistent and firm pressure on your child while they are laying down. The weighted blanket is a great option for a child with sensory processing disorder, affecting different senses, like touch. According to SensaCalm, by applying firm but gentle pressure, a weighted blanket delivers all of the benefits of a hug without forcing unwelcome or unpleasant body contact with another person. Although this doesn’t specifically apply to my daughter, the feel of the added weight on her body is comforting to her. I would recommend getting a child-sized weighted blanket, as a larger one could be overwhelming and possibly too large for a small child. This is the weighted blanket we use here. Since purchasing the weighted blanket for our daughter, she is less fidgety at bedtime and appears to relax a little more quickly. The velvet touch is also very appealing to her, and the color as well. I would suggest researching weighted blankets before purchasing one for your child because they can be pricey. Possibly show your child some pictures online and let them choose a color/design for themselves so they are more open to the idea of this kind of blanket. You can find blankets at Target and Amazon. Bedtime routines are important because they establish expectations and kids thrive on routine. When children get enough sleep, this limits behavior problems and overall, creates happier children. Happier children = happier parents. Consistency is key when teaching children new routines and habits. For us, we divide and conquer. My husband puts my son to sleep, and I help my daughter get to bed. By following our above ritual, we are showing our children the importance of routine. And did you know that when you maintain and enfore a routine, the expectation (from the child) on what’s to come can actually make them sleepier? In other words, your child knows when it’s time to have their bedtime snack, then it’s shower time, time to brush their teeth and then time to read, all leading to feelings of being sleepy (because that’s what comes next). So, create a routine that works for your family and run with it. It may take some adjusting along the way, and it may not work for both or all of your children the same. Setting expectations for what is to come next will likely have your kids ready to tackle bedtime with you. Some people can be really difficult to shop for, and I don’t think it’s because we are out of ideas. Gifting our moms can prove to be a difficult task because we want the gift to be perfect. Hence, the ultimate Mother’s Day gift guide! A lot goes into planning for a special occasion, and Mother’s Day is no exception. I have always preferred gifting rather than receiving, so I do enjoy special occasions. There’s just something fun and exciting about finding (or making) a gift that you know the other person will love! So the question remains, what do you get your mom when she already has everything? I’m going to break it down for you and divide this gift guide into sections. There are gifts for every mom on here, so I hope you find the perfect one! This post contains affiliate links. Read full disclosure here for more information. My family does pancakes every weekend, and this is a great spin on that. This waffle maker makes breakfast fun – and don’t forget the toppings! The best part, kids can help! Who doesn’t love games? If your mom is a foodie AND loves games, then I have found the perfect gift for you. Enjoy this gift with friends and have a girls night in. I love this because it serves multiple purposes! It’s a great way to grow your own garden and keep as a table centerpiece. This takes only 10 days to grow! A great gift for the mom of littles who could help to care for the garden. A flexible and light journal that is easily transported. This journal has blank pages, perfect for the cook who wants to write and save their recipes! Perfect to pass down to family members too. I have the Kentucky board and use it every day. It’s also a great photo prop. The board is easy to clean, does not scratch easily and is small enough to store in a pull-out drawer. Simple and casual, what a great way to shout from the rooftops just how blessed you are. Bonus points if you get one to match! I love this jacket because of the cinched waist! It gives a flattering silhouette, is very soft and perfect with leggings or jeans. I like these for a brunch with friends or a dressed down look for church. They have a very small heel, so they are comfortable and easy to walk in. Great for all-day wear! What a cute and airy hat, perfect for a weekend picnic with the family or for a beach vacation. Trendy glasses that will match any outfit. Over 10 colors available, all with 100% UV protection. These are meant to last, so they are worth the splurge! A faux-leather backpack that is perfect for a mom of littles! Take your laptop, some toys and snacks and get going. There is plenty of front storage and organization and it’s available in 3 colors. 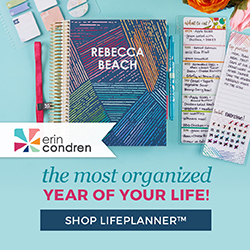 This planner is available in 2 different sizes and perfect to keep your day organized perfectly. Don’t forget to personalize the cover with your mom’s name! You can’t forget the accessories to go with your planner. The bundle takes the guesswork out and hooks you up with dual-tip markers, gel pens, mechanical pencils, fine-tip wet erase markers and a pouch for storage. Chances are, your mom read the oh-so popular Girl, Wash Your Face. This book was just released, so she needs the follow up! This is a great gift idea for the mom who loves personal development and self-care. This book contains 350 years of poetry and fiction by American women. What a creative and inspiring way to become prompted to write more! This adorable, bright and cheery bookmark comes in 4 colors/designs and is absolutely perfect for the book lover. It is portable and lightweight, perfect for your mom to throw in her purse when she needs it on-the-go! Available in 4 colors, this small adjustable desktop organizer is perfect for your mom’s home office. She can store her journals and favorite books, along with her writing supplies. This is a #1 seller for book lovers everywhere! It’s fast and responsive, has up to a 10-hour battery life and plenty of storage for all of your books. A selection of audiobooks for the kindle, available in 1 month, 3 month, 6 month, and 12 month subscriptions. Your gift includes 3 titles for each month! P.S. they will own the titles forever. This wreath has a simple and clean design and can be hung year round. This is perfect for the modern minimalist mama. And the best part? No maintenance required! This is a fun way to add a pop of color to your doorstep. I love this doormat for summertime! It’s fun and inviting, and has a coir front that’s perfect for wiping shoes. 374 pre-cut reusable letters, characters, symbols and emojis to make the perfect sign for your home. Bonus: add a sweet message for your mom before you gift it to her! These classic and sheek picture frames can be mounted or set on tabletop. The glass is shatterproof and the mounting hardware is included. These are perfect for an office space. Add photos of your family and they make the perfect sentimental gift. I am obsessed with this set! You get a set of 4 mugs, 16oz each. That is a lot of coffee! And, there are matching sets of pasta bowls, cereal bowls and even salad plates. The bright colors will surely make your mom happy! A great gift idea for the mom who just needs to relax. This diffuser is a quiet 5-in-1 humidifier and fragrance diffuser with 7 LED color changing lights. This diffuser is clean and simple and would fit in most homes. And don’t forget the essential oils! I love the idea of a programmable coffee maker. Who doesn’t want to wake up to the aroma of coffee? This coffee maker is small and compact, easy to use, and has 3 brewing options! Treat your mom to fresh coffee! This blanket is the softest sherpa blanket ever! It is large enough for 2 people to share comfortably and even comes in 20 colors. So pick a color that matches your mom’s couch and get to snugglin’! This is the perfect gift for your dog-loving mama! You can select from silver, gold and rose gold and there are 25 puppy options. And don’t forget the dog’s name for a personal touch. If your mom loves her dog as much as you, go on and add this one to the list! Be sure to check out the Etsy shop to look around! Ok. Seriously?! This custom portrait is beyond cute and creative! It will come to you as a digital file, so you can choose the size and how many people and pets you prefer! Please check out the Etsy shop! This sweet little pup is made from ceramic material, and weighing in at 4.6 pounds, it is tabletop compatible. I think this would also be adorable sitting near the front door of your mom’s home, or on a bedside table. This book has super cute pictures of sweet pups, along with key lessons our canine companions are here to remind us – such as how to live in the now. This would make a great coffee table book. This shirt is the perfect lounge-around-the-house shirt! It’s clean and simple with a cute knotted front detail. This tumber is double wall vacuum insulated, so it will keep your drink, whether hot or cold, just right. It’s also stainless steel and BPA free. This 2 pack silicone mold comes with a recipe booklet too. Perfect for the mama who wants to spoil her pups! Help your mom make the dogs some healthy treats and spend quality time together. These adorable novelty charms attach safely and securely to any type of glads, including stemless glasses, martini glasses, Moscow mule mugs and even coffee cups. They also work as refrigerator magnets, too! These are the perfect little accessory to have on hand for girls night, a picnic with the grandkids, or just for everyday use! Happy Shopping and Happy Mother’s Day! There is a lot that comes with being a parent, but a majority of parenting is learning as you go. As a parent, you know there is no handbook or rules for what to teach our children, and oftentimes, we wish there was. When you think about what kind of person you want your child to be, what comes to mind? What lessons will you teach your child and how will you do that? Unfortunately, we often hear “children are so entitled these days”, “when I was little we played outside, but they rely on those video games”, and we can’t forget that “children have become so soft.” When in reality, times have changed. Children are extremely impressionable and eager to learn. It is our responsibility as parents to teach our children valuable lessons that will take them far into adulthood and help with their future successes. This post contains affiliate links. Please read full disclosure for more information. Teach your children the value in volunteering. There is something powerful about sharing your time. It’s one thing to give money or to donate goods, but it’s even better to donate your time. Time is precious and you cannot get that back. While volunteering, children will learn the importance of community, and how this will benefit their community. Giving back is a great way to learn teamwork and how to effectively work with others well. This is demonstrating that all people matter and that we are all called to serve others. My grandmother would take me to churches and soup kitchens when I was a child, and that is something I want my children to experience as well. I was young, maybe 6 or 7. There, I learned how to speak up and communicate with other adults, confidence (because I was often stepping out of my comfort zone), flexibility (because they would tell us where we needed to be and what needed to be done), and organization. Did you know that volunteering is good for your health, both mental and physical? It’s true! Giving back allows you to focus on the importance of that moment you are in, decreasing stress levels and increasing your sense of purpose in life. Take a look at this infographic from UnitedHealth. Our children are always watching and listening, so it’s important to be kind. We teach kindness by simply modeling it ourselves. I remind my children often that people will always remember how you make them feel, so make them feel good. Becoming a mom has helped me to be more kind and accepting overall. Patience is learned, almost forced actually, and we become more self-aware. For instance, you are driving to the store, kids in tow, and another car cuts you off, forcing you to hit the breaks. You’re annoyed and probably want to say a few choice words, but you stop and remember that your kids will hear you and probably repeat it. Even in small moments like that, you are showing your children how to respond to a negative situation. Children should always know how to respond with kindness, no matter what the situation. It’s also important to remind children that they are human and have big emotions; how we handle situations is what matters most. We should also acknowledge our children for acts of kindness they are doing in and out of the community. This could be as simple as holding the door for someone, or letting an elder or a pregnant woman go ahead of them in line at the store. By praising them, we are acknowledging that we see and are proud of their decisions. Friends will upset us at some point, feelings will be hurt and patience will be tested, but forgiveness and grace will shine a spotlight on the kind of person we truly are. Again, this comes back to us as parents and how we handle ourselves with others. It’s healthy to have disagreements and to feel upset with others, but it’s even healthier to forgive and let go. And that is the true value in the lesson of forgiveness. Keep in mind that children are still learning important aspects of communication and how to nurture relationships, so for young children, a simple smile or hug will do. You cannot force someone to move on from their hurt, but by teaching them to see the good in others, we are setting a foundation for lasting relationships and happiness. When children misbehave or become disrespectful, it’s easy for adults / parents to become angry. It’s important for us to remain calm and find the reason behind the behavior and disrespect. All too often, it is simply children being children. Set clear expectations so they understand what is appropriate and what is not. It is up to parents to speak to children with respect and model respect for children. Picture this: you are working at your desk and your child appears, “Mom, I need food. I’m really hungry.” Seems simple enough, right? But how we respond will make all the difference in how the situation ends. Being interrupted, you are annoyed and immediately snap back, “Can’t you see that I am working? Don’t interrupt me!” You surely wouldn’t speak to a coworker in that way, so why should our children be treated differently? When you speak to your children with a rude and disrespectful tone, they will quickly pick up on it and this could easily damage their self-esteem and trust in you. If children witness adults speaking to others like this, they will accept this as normal behavior, when in fact, it is not. Similarly, teach children to respect others’ preferences. Just as my 3 year old often enjoys wearing mismatched clothes and socks with her sandals, we need to respect her preference to do so. Of course this might seem miniscule compared to the real world and adulthood, but each little lesson we teach will eventually make a big impact on them in the long run. Confession: mismatched clothing and socks with sandals makes the OCD in me cry out in pain. But I know others find their sense of style at that age endearing. I haven’t reached that point yet. When children learn to respect others’ wishes and qualities they have, they become more accepting and inclusive of others. Growing up in the real world, it won’t take children long to see the variety of people out there, and hopefully they can appreciate that. Respect should not stop at others. Teach your children to respect themselves as well. We can achieve this by respecting our children’s personal space and emotional wellbeing. Show your children how much you love yourself by practicing self-care and using daily affirmations. Take the 7 Day Self-Love Challenge with journal prompts. Work ethic is so important for today’s youth. This will only set them up for success in the future. Children will also see this modeled by parents. And believe it or not, most children actually enjoy contributing to the home, as this can help them to feel valuable. As parents, it is our responsibility to teach and model a strong and positive work ethic for our children. I have a 3 year old and a 6 year old who each have weekly chores. Simply establish, enforce and reward their efforts and the tasks they complete in order to maintain a consistent routine. Make sure the tasks you set for each child are age-appropriate so they are able to successfully complete them on their own. Another way to teach a strong work ethic is to allow children to do some tasks on their own, independent of anyone else’s assistance. This will teach them how to problem solve; if one way of doing something does not work, they must find another way. When children gain independence, they also gain confidence. In the long run, children will be more inclined to try new things and to do so without giving up. What are some lessons important to YOU that you hope to teach your children? I would love to hear them in the comments below. This post may contain affiliate links. Read full disclosure below for more information. A healthy relationship can bring out the best in you; it can build you up, provide a strong sense of security, as well as connection and support. As humans, we desire other human connection and support, but there’s more to it than just hoping for those things in our relationships. We have to work toward that, and make sure it is reciprocated. So how do we know what it is that makes a relationship healthy? Try to think of past relationships that have failed and what has worked. Look to relationships you admire. Although it is true that you don’t really know what goes on behind closed doors, you can grasp a general feeling of others’ relationships if you spend enough time with them. A spouse or partner will take interest in most things that their significant other enjoys. And I’m not just referring to sports or the DIY network. I’m referring to a genuine interest in your significant other and the things that are closely connected to them; hobbies, friends, career, family, background and more. This should ultimately be the foundation of a strong and healthy relationship, because if you are not interested in them, then what is it you are interested in? When you are speaking with your significant other, you can express a genuine interest by listening. Not just listening to be polite, but rather actively listening to show that you care about what they have to say. Being honest is simply good for your mental health. Think about it, when you tell a lie, it can hurt others you love and then create a deeper wound when it comes back full circle. No one feels good when they aren’t honest and upfront, especially regarding feelings and matters in marriage. Communication is essential to a strong and healthy relationship. If you are unable to communicate with honesty and love, your relationship is lacking and in serious trouble. When you and your spouse have honest and open communication, you are showing that you can be trustworthy and loyal. I know you’ve heard the saying honesty is the best policy. That absolutely pertains to your relationship, no matter the length of your partnership. Honesty sets a strong foundation for continued communication, even when times are tough, and it demonstrates a sincere concern for any issues that might arise. Honesty leads to trust, and trust leads to a deeper connection and feelings of security. Disagreements are inevitable, but it depends on how you handle those disagreements that really matters. By fighting fair, you are able to discuss your differences within boundaries and there is no keeping score. In other words, you are still showing a level of respect and regard for what your spouse or partner has to say. Maybe you don’t like your husbands choice of punishment for your 2 year old, or you are barely able to make ends meet this month, or it could be an intrusive, although well-meaning, mother-in-law. My tip would be to set boundaries and practice your honest and open communication. There must be compromise and negotiation so there are no feelings of resentment in the end. One does not win an argument when fighting fair, but is self-aware and able to understand other points of view. Fight to resolve, not to win. The little things are what tend to stand out the most in happy and healthy relationships. You know, the breakfast in bed, the flowers that he sent to your office for no reason at all, or maybe the love note you put in his lunchbox that morning. We each have little things that we love and that fill our tank, and when your spouse or partner is making an effort to do these little things for you, you are in a good place. When you take the time out of your busy day to make your spouse smile, you are showing how much you care. And this is something that takes less than five minutes. The great takeaway here is that these little things really add up to one big thing; a mutual appreciation for each other. A successful and healthy relationship is full of laughter and excitement. When you make an effort to try new things together and have fun, you are surrounding your relationship with positive energy. The butterflies might fade over time, but when you share light and fun experiences together, it can re-introduce those feelings and lead to a deeper connection. Date nights are a great way to ensure fun and new experiences. My husband and I strive for one night per month to be kid-free and focus on us. These dates don’t even have to cost anything. Drive around town or visit your local park and go for a hike. Really anything where the two of you can focus on your connection and just being together. Do you have a healthy relationship? I would love to hear what strengthens your bond. Sometimes lies are meant to help us deflect. Other times, they are simply excuses. Maybe excuses because we don’t want to accept responsibility, or we are unwilling to make the necessary steps to change our behaviors. As women, we are often pitted against each other and forced to compare ourselves to others. People tend to share their highlight reel on social media, not the tough times or the real moments that we might experience in our day-to-day lives. Unfortunately, this can significantly impact the way we view ourselves. I think we have become so numb to our own thoughts and affirmations that we don’t realize the excuses and justifications we make regarding day to day tasks and experiences. So, here are the lies that I believe we tell ourselves way too often. For me, this one is just too real. It’s no secret that eating well and exercising will result in a healthier lifestyle, including weightloss. It’s also no secret that everyone knows this. So why do we tell ourselves that it’s more complicated than that? Because it’s hard to lose weight! Of course we feel better when we take better care of ourselves and eat a balanced diet, but that doesn’t mean we actually want to eat better (at least not all the time). Finding the right support and accountability can also help you to shift your mindset in the right direction. People respond better when we have others in our corner cheering us on. But it definitely takes more than others simply believing in us; we must believe in ourselves too. Quit sabotaging yourself with those limiting beliefs that you cannot do it, when in fact, you can! I remember growing up, always watching the women in my life try new fad diets and complaining about their physical appearance. I even remember my Mom telling me that ‘some people are just thicker than others and once you have kids, there’s nothing you can do about it.’ Obviously, I understand now that those beliefs are just not true and merely excuses for someone who doesn’t want to do anything about it. Two things will really help you with weightloss: planning and discipline. Motivation comes and goes, but discipline means being in control. My tip is to know your goal and make sure it is obtainable and realistic. When you plan for a week at a time, it seems less daunting and overwhelming. You are capable of losing weight safely and successfully with hard work and a positive mindset. Look, we’re all busy. Every single one of us has more going on than we should and it can be difficult to balance. However, a lot of it is perspective. Maybe a little time management, or some simple organization could help. Think of it like your daily affirmations; what you continue to tell yourself over and over again you will begin to believe. Are you really too busy to play with your children? Or do you just have laundry and dishes piling up from the weekend? Are you really too busy to give your mom a call at the end of the day to check in? Or do you just want that 10 minutes of time for yourself? Are you really too busy meet your friend for dinner? Or would you rather catch up on DVR? Do you get what I’m saying? These are all excuses. When you actually want to do something, you will. You make time for the people and the things that are important to you. You are not too busy, you just don’t want to, so don’t lie to yourself about it. Let me say that I do not think we tell ourselves this lie out of malice, or to be cruel to others. I truly believe that we have told ourselves that we are just too busy to cram anything else into our calendar and after a while, we believe it. Try this free downloadable daily planner to help you with your daily to-dos and goals. Again, enough with the limiting beliefs. You must first love yourself before you can truly love others and have that reciprocated. So the question is, what is it that is holding you back from seeing your worth? This is the perfect opportunity for you to dive into a bible study with friends, or commit to daily devotionals. I would even encourage you to do a simple self-love challenge. That past relationship that went south doesn’t define you. The relationship you had with your parents growing up, it doesn’t define you. It’s part of your story, but the future and what comes next, is up to you. By revisiting old wounds, you remain trapped in the past and unable to make progress. It can be difficult to move on and feel like you will come out on top, but I want you to know that God has a plan for you. You do not have to understand God’s plan to trust its purpose. You just have to believe. You are only right if you don’t make the effort to change. Like with many obstacles to overcome, you should set a goal and then identify actionable steps to move closer toward that goal. Map it out if necessary and post it on your vision board. When you see it first thing in the morning, you will be more likely to follow through. Share your goal and your thoughts with someone else so they can help to hold you accountable. Failure is one thing if we are the only ones who know about it, but when you have to answer to a friend, it changes the game a bit. Change is hard because we are often scared of what might come from that change. I will admit, I am a creature of habit. I don’t love change and I am not spontaneous. So for me, change does not come easily. Luckily, I am married to a man who is my polar opposite, so he pushes boundaries and can help me to step out of my comfort zone a bit. Find a friend or family member who has your back, someone who will not judge you and will take that next step with you. Excuse me while I roll my eyes real quick. I could easily write this entire section in all caps, but that would be rude. Ladies. Quit comparing yourself to other women. Hear me when I tell you it does not benefit you and it will steal your joy. Unfortunately, a lot of this belief that we must compare ourselves to others comes from everyday situations, even as children. At school, our children’s behaviors are marked by colors and displayed in front of the entire class. Someone will always be the better athlete and get the trophy. And that promotion at work, forget about it because she already earned it. This does not mean that you do not measure up, or that you are less-than. Everyone has a different journey, and just because now isn’t your time, doesn’t mean that tomorrow won’t be. There is so much joy in the journey and that is what we often forget. We don’t know how long it took someone to earn their raise, or to lose 20 pounds, and we especially don’t know or understand the struggles they faced while pursuing those goals. Not everyone is great at everything, and that’s just part of life. As an adult, what kind of example are we setting for our children if we are always playing the ‘what if’ game and cannot allow ourselves to be content with what we have and who we are? I would encourage you to find your passion, set some goals and take the necessary actionable steps to get there. Don’t forget to set a deadline for yourself in order to create some sense of urgency! We’ve all been there as parents. I have felt this way too many times to count and can even acknowledge that it is a completely false and irrational notion. We put this unreasonable expectation on ourselves to only, once again, limit our beliefs in our own actions and abilities. Days with children are long and exhausting, but they are also rewarding and humbling. It is so important that you remember you were chosen to parent your child and no one can do that better than you. It is likely one of the most challenging and important roles you will ever carry and that is where the worry and guilt falls into place. Seek out mom groups or bible study groups that can encourage you and lift you up as a parent. When you spend time with other moms, you will quickly see that you are not the only one who cannot convince your child to eat their lunch, and your child isn’t the only one who has bitten or pinched at daycare, and potty training – yep, other parents have kids who would only poop their pants. There’s strength in numbers and those words of encouragement from other moms like you will go a very long way. I hope you remember that you don’t always have to have it all together. You are allowed to be a mess, to screw up, and to have bad days. You are still an amazing mom. Can we all agree that it’s time to be kinder to ourselves and to accept what we are unable to change but to take the necessary steps to change what we can? Are you guilty of telling yourself any of these lies? When you catch yourself in this vicious cycle, how do you take a step back?